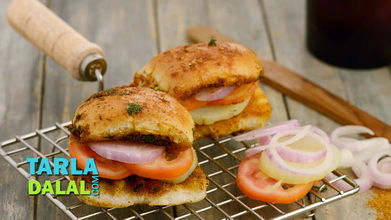 French bread meets desi spice in this innovative Paneer Tikka Sub Sandwich. 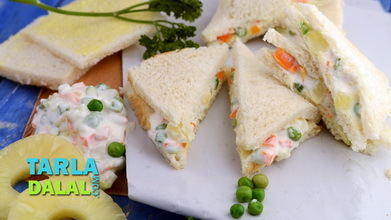 Here, French bread is layered with luscious mayonnaise, cheese and veggies along with a tongue-tickling paneer tikka filling. 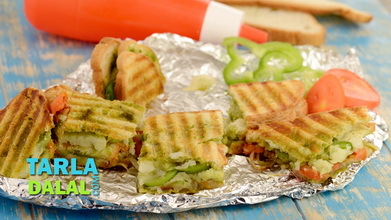 The juiciness of the veggies, the unbeatable taste of cheese, the spiky flavour of the sauces and the truly irresistible filling dance together on your palate to give you a mind-blowing experience. 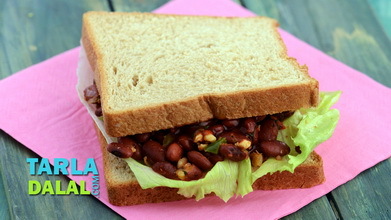 The addition of dried fenugreek leaves to the filling along with other spice powders gives it a fabulous flavour, which is so tantalizing that your taste buds keep yearning for more, long after you are through with your sandwich. Combine the curds, besan, chilli powder, ginger-garlic paste, dried fenugreek leaves, garam masala and salt in a deep bowl and mix well. Add the paneer and mix gently. Keep aside to marinate for 15 minutes. Heat the oil in a broad non-stick pan, add the marinated paneer, mix gently and cook on a slow flame for 5 minutes, while stirring continuously. Keep aside to cool completely. 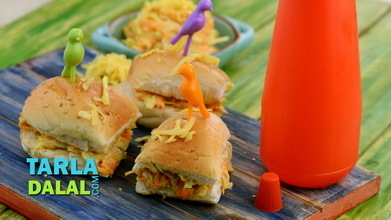 Place the french breads on a clean, dry surface and cut each bread horizontally into two. 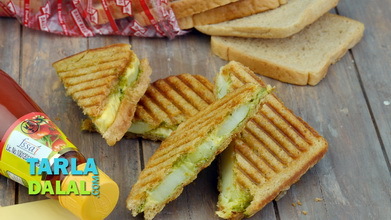 Place two cheese halves on each of the upper half of the breads. Place the bread halves on a baking tray and bake in a pre-heated oven at 200°c (400°f) for 5 minutes. Keep aside. 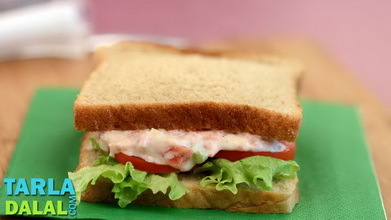 Place the lower half of a bread on a clean, dry surface and spread ¼ cup lettuce evenly over it. Place 3 tomato slices, 3 cucumber slices, 3 onion slices and 2 capsicum rings evenly over it. 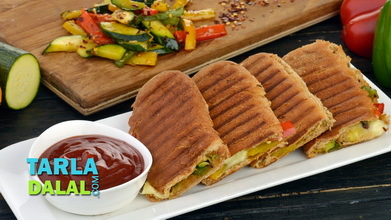 Spread a portion of the paneer tikka filling evenly over it. Spread 1 tbsp black olives and 8 jalapenos evenly over it. 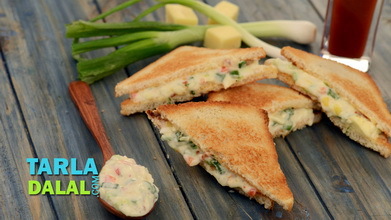 Spread 2 tbsp mayonnaise, 2 tsp chilli sauce and 1 tsp mustard sauce evenly over it. 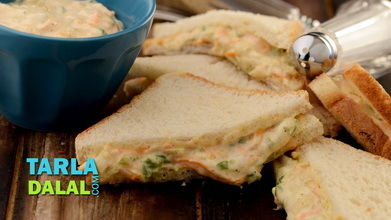 Sandwich it with the upper half of the french bread with the cheese side facing downwards and press it lightly. Repeat steps 4 to 9 to make 2 more sub sandwiches.